Do you ever look around your house and wonder how things got so out of hand? Bethany and I have struggled with “homemaking” since the earliest days of our marriage. …kids came along and the household duties grew exponentially with each new child. And after 14 years of marriage, the challenges never go away since our family’s needs continue to evolve. I definitely get overwhelmed with it all sometimes, but I think it’s especially hard on the wife of the home. Bethany has told me that when she was a little girl, she dreamed about getting married, becoming a mommy, and having her own home. She imagined a home that was more than just 4 walls, a roof, and a mortgage. • a safe place for personal expression, sharing and growth. …laundry, diapers, stretch marks, and never-ending meal prep… money worries, gritty floors, soap scum, and the stain that won’t come out of our son’s favorite shirt… holiday stress, and teaching our daughters to read (and master long division)… a husband who works long hours, a kid with the sniffles, stomach aches and a fever… and a secret dream to run her own little business from home. 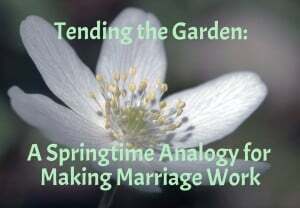 As rewarding as it is, homemaking is hard work and it doesn’t always come easily. It turns out that we’re not born with all the knowledge and patience we need to keep a happy, organized and faith-filled home. Nope, the truth is that Homemaking is a Skill! And that’s awesome news because it means that you can learn to be a better homemaker and get specific help in those areas that cause you stress. 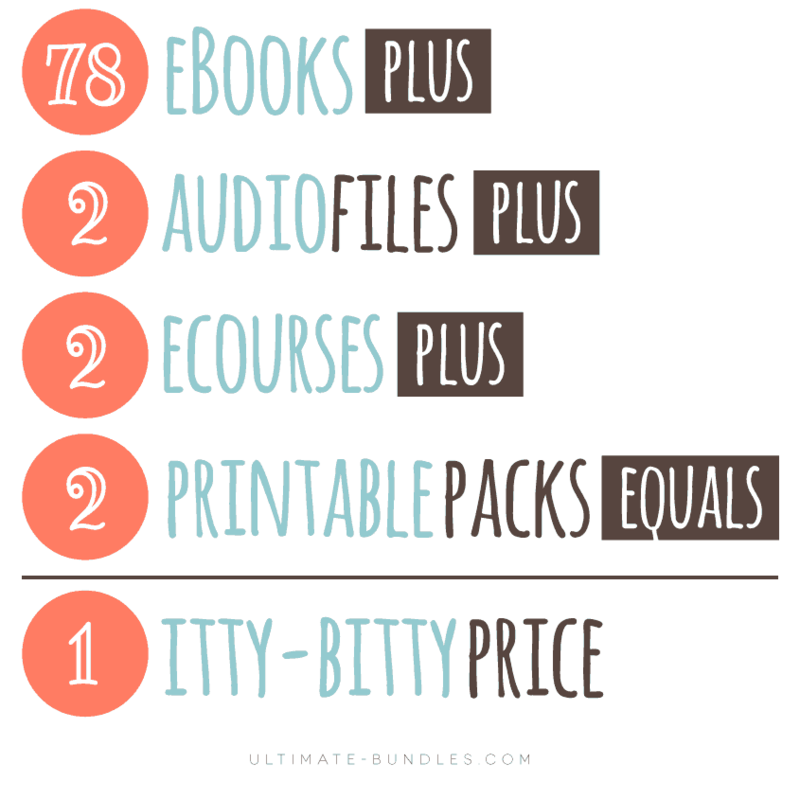 That’s why we’re thrilled to announce the Ultimate Homemaking Bundle! This is a collection of the best resources in the world when it comes to homemaking, and we’ve used several of these books to help run our own house with less stress and more smiles. It is a complete library of 99 eBooks and eCourses to help you nurture the beauty and productivity in your home and family relationships. There are also some amazing bonuses from generous, inspiring companies that understand homemakers like you. Every gift is yours to enjoy. I wonder which one will be your favorite? Even if you only want a few of the nearly 100 books in this bundle, it’s still an incredible value. As if the massive value provided by this bundle wasn’t enough, I want to sweeten the pot a little more and make sure you get the Marriage help that you need. Plus, when you purchase the bundle through my special link, I get a referral bonus so it’s a win-win. So, when you pick up the Ultimate Homemaking Bundle this week, I’m going to give you a FREE copy of our popular 15 Minute Marriage Makeover Premium Edition. This includes the book plus some amazing bonus materials (a $16.99 value) – you can see the details here. 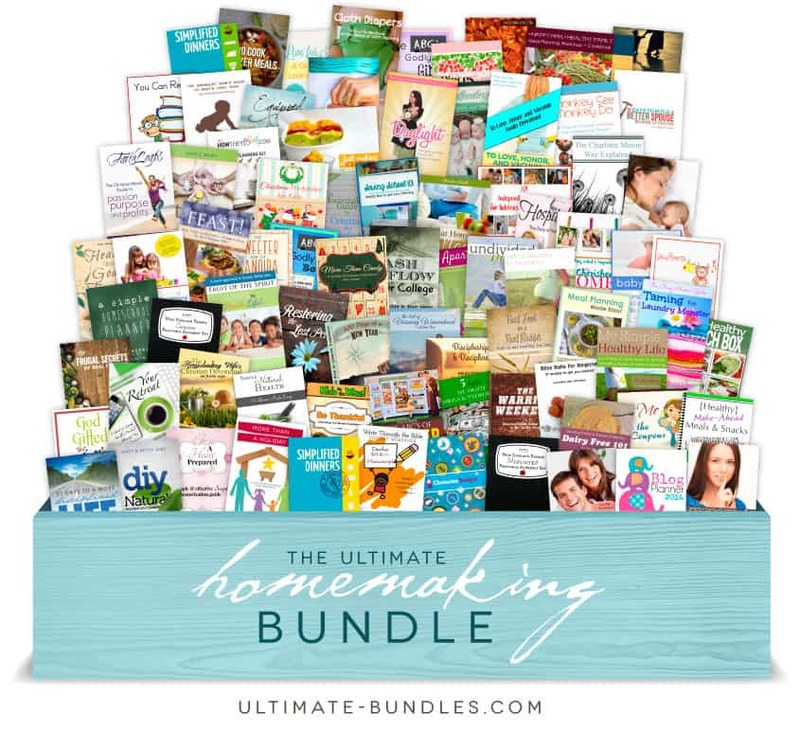 To claim your bonus, just purchase the Ultimate Homemaking Bundle through this link. Then forward your receipt via email to me at Dustin [at] engagedmarriage.com and we’ll get you hooked up! 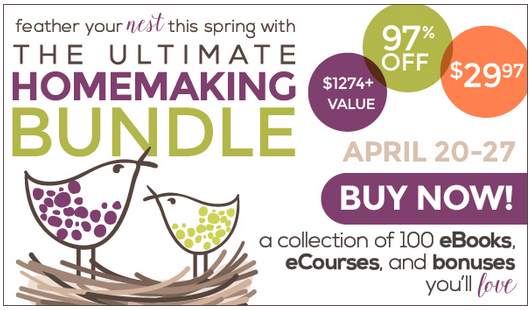 IMPORTANT: The Ultimate Homemaking Bundle will only be available from 8:00 a.m. EST on Monday, April 20 until 11:59 p.m. EST on Monday, April 27 so pick it up now while you’re thinking about it. So, what’s the #1 thing most couples say is the key to a happy marriage? And of course it’s become the cliche, go-to response from grandparents when the video camera comes around at every wedding reception for good reason. It’s true! Good communication skills impact every single aspect of your relationship – from how you handle money to how you raise your kids to how you make your kids 🙂 – there’s just no way around it. So, I think we can all agree that communication is vital to a healthy and happy marriage. Want to Communicate With Your Spouse Like the "Good Old Days"? Then don't miss our special announcement at the end of this post! That said, when’s the last time you’ve given your own approach to communication with your spouse any thought? If you’re like me, it’s been a while – like most important things, it’s entirely too easy to lose sight of in the face of other more “urgent” matters. Well, I was thinking about it recently, so I reached out to the smartest group of people I know for some advice. 1. Under-communicate criticism. Over-communicate praise. 2. Make your body language and your words match. 3. Always fight fair and remember you can’t take back hurtful words. 4. Use “I” statements, not “you” statements. 5. Don’t share your spouse’s faults with your family and friends. You will soon forgive, but they may not. How great is that? These tips are 100% spot-on and I love them. I love good marriage tips and posts with lists of Top 5 Ways to do stuff (like this one) as much as anyone. They’re often inspirational and make us feel good when we read them. Heck, we may even remember one or two quips to pass along to a young couple. The problem is wonderful tips like these rarely impact your marriage in any real way. You read them, nod and go back to doing the exact same thing in your life. The truth is that it takes a little more effort to make a lasting and valuable improvement in your relationship. Here’s a few reasons why reading top tips doesn’t help much and what you can do instead. The reality is that you need to invest in training to make it stick. This can be in the form of focused time or money, preferably both. There’s free information on every topic under the sun available on the Internet, but quick and free advice rarely makes a meaningful impact. It’s only when you’ve got some “skin in the game” that you take what you learn to heart and make it count. I’d say this is the biggest problem most of us face when we learn something valuable, and it’s tied directly to the lack of investment we have in the advice. You can get the best marriage-boosting tips in the world, but it means nothing if you don’t act on it. Those who take action on mediocre ideas will get infinitely more results than those that take no action on the best ideas. If you want to improve your marriage, do something (real) about it. This is the final area where people fail when it comes to learning and growing. The reality is that sometimes we need some personal attention from a trusted expert to see results, and it’s always really beneficial to be part of a community. With a sense of community, we get inspired to take action and there’s a sense of accountability. Of course, the best accountability is a spouse who is walking alongside us in our journey to being the best husband or wife we can be. I’m not going to go all Debbie Downer on you and leave you hanging here. I’m going to tell you what you can do to make a lasting impact for the better – and it’s pretty darn easy. Last year, I was trying to help a reader with an issue related to communication. It was a pretty common question that I’ve seen many times. I was starting to give her a similar answer that I’d given others in the past. As I was typing my necessarily limited email response, it hit me – this is awesome advice that’s not going to be useful at all. She needed more than my short “tip-type” response could offer. She needed a full answer with practical action steps provided in a setting that required focus and investment on her part. And frankly, she needed it from someone other than me. Well, I should say my perspective was good, but adding in the perspective of a true communication expert was exponentially more helpful. So, that’s where the idea of the Engaged Marriage How-To Workshop series was born. I host a workshop accompanied by a guest expert on a very specific and highly important topic. We present very practical, action-oriented info that benefits married couples. Plus, we answer personal questions during the event and usually have bonus materials (like books) to maximize the help they receive. We’ve completed five of these How-To Workshops on various topics so far, and the results and feedback have been tremendous! 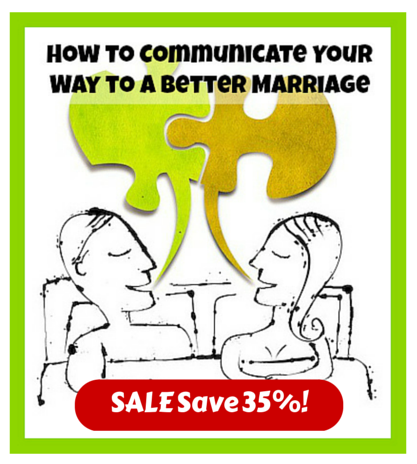 Our most popular How-To Workshop was one on communication called How To Communicate Your Way to a Better Marriage (Talking Optional), and we’ve made it even better with new bonuses and more convenient ways to use the training (video, audio and full text transcript). As we bring it out of the vault (you know, like a Disney movie), we decided to have a Kick-Off Sale this week – you will save 35%! I was joined for this workshop by my go-to resource when it comes to healthy and helpful communication, Dr. Corey Allan. Corey is a marriage and family therapist, and he’s also a father and a husband for over 20 years. He’s awesome. This communication workshop is practical, actionable and it will impact your marriage for the better. We actually guarantee as much. So, if you’re ready to invest in your marriage and take solid action to be a better communicator with your spouse (and everyone else), you should definitely check out this workshop. And there’s no better time than right now during our big sale. Click Here for Instant Access to the Communication Workshop! Remembering there’s a pony in there somewhere when the going gets difficult. Last fall I read the book 10-10-10: 10 Minutes, 10 Months, 10 Years, A Life-Transforming Idea, by Suzy Welch, and my entire family picked up another powerful tool that changed the way we make decisions in all areas of our lives. The concept is to make decisions by deliberately considering their consequences in the immediate present, near term, and distant future. It is a reliable and methodical way to arrive at a sound decision that really works, yet takes into consideration your emotions, feelings, and values. Begin with a question. You’ll want to define and refine this so you know exactly what problem you want to fix. Recently I had had it with our side-by-side refrigerator. It came with the house we bought last year and runs just fine, but it doesn’t hold much, particularly in the freezer section. I began to dream about a shiny new French door model, and actually shopped a bit with my husband, but then caught myself. What problem was I trying to solve? After doing some brainstorming, I realized the problem was more about my irritation and dislike of side-by-sides because I have to be more careful about how much I purchase or cook so I do have room to store it. The question then became this: Can we buy a refrigerator we’ll love, that will meet our needs, that is within our budget? Move onto the information collection to determine options. For us, that meant figuring out what our optimum storage needs would be and gathering information on pricing. It also meant looking at buying used, as well as what it meant to keep our existing fridge. Determine the short and long term effect of each option. This is where the 10-10-10 comes in. The first 10 is the present and could represent today, tomorrow, next week. The second is that point in the foreseeable future when the initial reaction to your decision has passed but its consequences continue to play out in ways you can reasonably predict. This could be 10 days, 13 weeks, 8 months, depending on your situation. The final 10 is quite a distance out—so you’ll estimate the effects in more vague terms. The present: We’d have an awesome new fridge that went way over budget, or we’d buy a used one and stay under budget, or we’d keep the one we have until it dies. 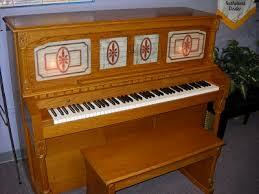 We’d have plenty of space for storage if we bought something different. Near future: In about a year, the effect is still the same, although each passing year means the existing unit could stop working. If we bought new, we may really need that money we had to take out of another part of the budget to cover the shortfall in the refrigerator budget, and that might create some hardship. Future: In five years, we wonder how our need for storage may change, especially since we’ve had closer to three to four persons living here most of the time rather than just the two of us. Also, we’d like to remodel the kitchen and realize the plan would have to work around the newer refrigerator. If we wait, we can save more money and buy what we want and need, assuming the existing unit lasts. That’s a calculated risk we’re willing to take. Once we started to analyze the effects in concert with our values, the decision was incredibly easy to make. Living within a budget has given us so much more peace of mind and freedom than we used to have because we are not spending endlessly and mindlessly. We deeply value our debt freedom, our commitment to be wiser with our finances, and to be great role models for our family. I wanted a new refrigerator, I did not need a new refrigerator. We already owned a good used refrigerator, so we decided buying another used one at this time was silly. We weren’t willing to buy a new refrigerator unless we loved it and it met our current and potential future needs, and we couldn’t do that in the budget we had. So, the old refrigerator still hums along in the kitchen, but I don’t hate it anymore. I love that it runs the way it should so that we can continue to save towards a different one down the road. When you make your decisions using this process, you will come away with a solution that really works and with which you are really comfortable. 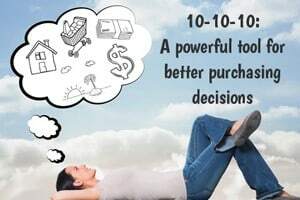 Every time each of us uses 10-10-10, we are thrilled with how it slows the adrenaline rush to buy just enough so you can make a decision that works for today and for your future. Once you start using 10-10-10, you’ll discover it can be applied in all areas of your life including work, friend and family relationships and responsibilities, marriage and parenting, and finances, and eventually becomes an automatic part of your decision making process. I highly recommend reading the book for more information and insight! Comment: What decision can 10-10-10 help you make today?